Assorted holiday prints. Almost everyone has a Duck Tape story to tell, usually praising its remarkable strength and versatility. 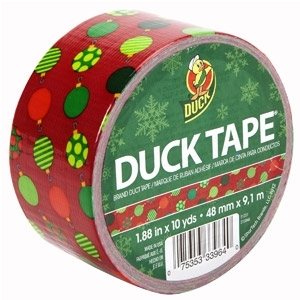 Duck Brand Duct Tape has a wide range of applications, both traditional and nontraditional, and is now available in over 20 colors and patterns, making it even more useful than ever. Because of its strength and adhesive properties, you can use Printed Duck Tape for almost any job, including everyday household and auto repairs-anywhere a flexible and weather-proof bond is needed.